Korean makeup | Oh Happy Dae! Posted in make-up, vlog	by Oh Happy Dae! I can’t resist! 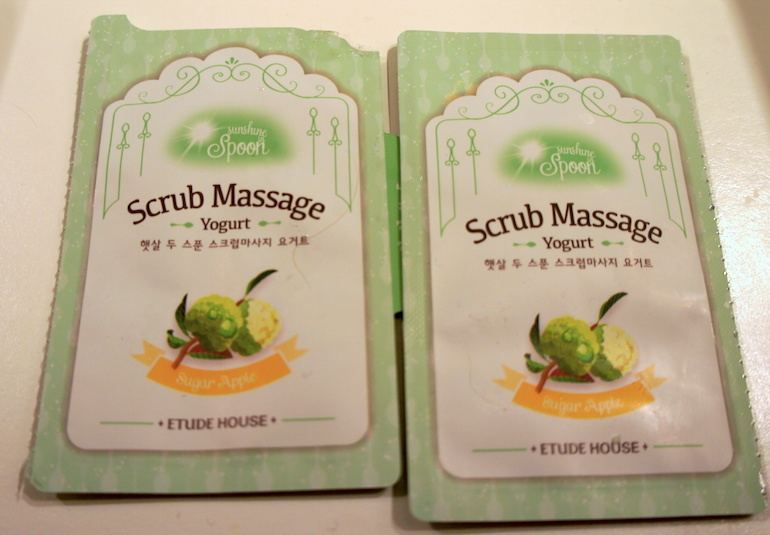 I know I said I’d try to avoid Etude House for my next review. But then I found out they ship internationally now, *and* they had an offer for free shipping at the time. How could I resist? I’m always attracted to Etude’s cute packaging, so this caught my eye. Not quite a tint, not quite a gloss. I’d say it’s somewhere in between.The color was great and not my usual choice. The consistency of the liquid is somewhat thick. I definitely had to blot so it was the consistency I wanted, but it’s not unreasonable. I like it! 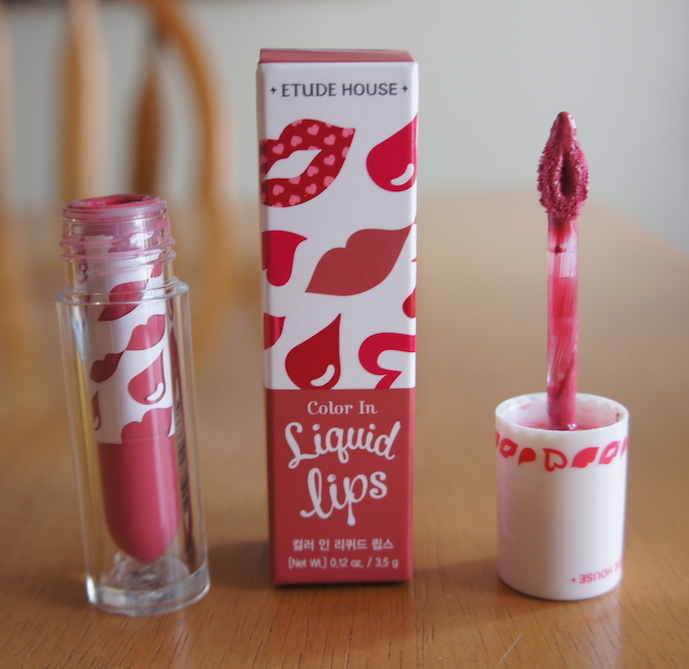 I had high hopes for this because the reviews on Etude’s site were pretty good. It has not disappointed! It’s still not a product I use regularly, but it does what it’s supposed to. In general my problem is that eye shadow wears off fairly quickly. I noticed, though, when I used the primer that it took much longer. Eyeliner seems to keep on better as well. A worthwhile product! This is a pretty basic cleanser here. It has a fairly strong smell of peach (bit more like peach iced tea). At first I had a problem with it because I felt like my eyes were really sensitive to it. Now that I’ve been using it for awhile I don’t find I have that problem as much anymore. I actually had a similar problem with Trader Joe’s tea tree oil products (i.e. shampoo, cleanser), but after I got used to them it wasn’t an issue. So I guess there’s an adjustment period. It’s a decent product, but I wouldn’t necessarily go out of my way to get it again. I don’t usually use packs, but I decided to try this one. The consistency isn’t very thick or anything. Honestly, I don’t worry tons about my pores. Maybe it’s because I don’t pay attention to that sort of thing. Anyway, I’ve used this a few times since I bought it. I’m not 100% sure how it affects my pores or anything, but my skin feels pretty smooth afterwards. Other reviews I’ve seen seem to like it, so I’ll keep using it! This is a very gentle scrub as described on the site. The scrub granules are pretty small and the lotion (yogurt?) is fairly thin. You don’t need a lot when you use it. I actually used 1 pack 2-3 times because you don’t really need the whole thing in one go. It’s a nice scrub you can use about once a week for a sort of in home spa treatment. I always wanted to try these sleeping pack things. I don’t know why. It just looked… interesting? I ended up buying Evening Primrose and Seaweed. I’ve only tried the Primrose at this point, and I guess I don’t know what to say. Maybe I should have inspected my skin more closely. I thought my skin felt smooth and moisturized. Other than that, though, I’m not sure what to say. People on the site really like it, and I enjoyed the concept/packaging. I’m pretty bad with my brushes. I know I should take better care of them. So I bought this little guy. It’s soooo soft! 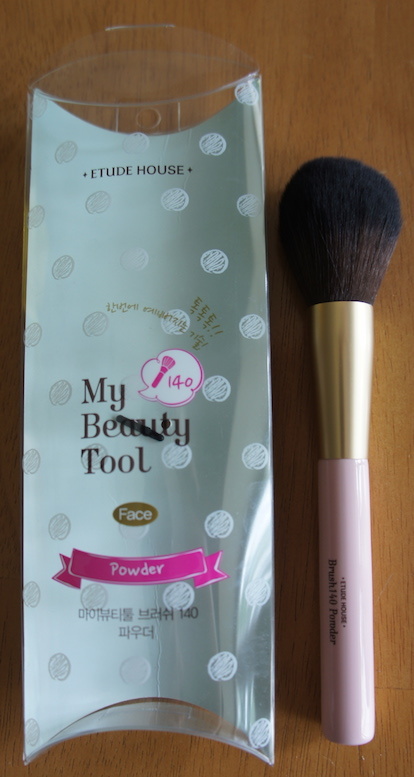 And I noticed after I started using it that it holds powder so much better than my (very) old one. Gotta take care of this one! I love perfume bars. They are so convenient! You can keep it at home, in your desk, in your bag, or take it on a trip. 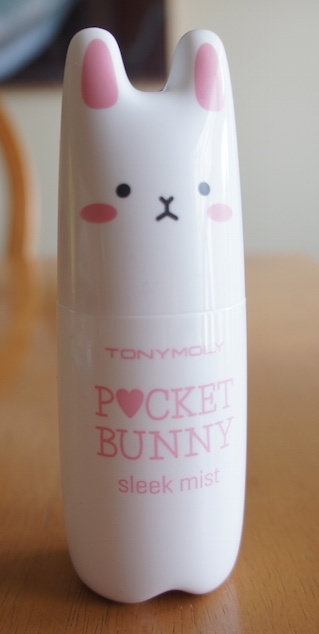 I loved the first one I bought from Tony Moly, but they don’t make that scent anymore (*sadface*). I decided to go with this one instead (#3 Bloom Bunny). The scent is nice! It’s very fresh and clean, like laundry you just took out of the dryer. These pocket mists are meant to give your skin a little extra boost during the day. 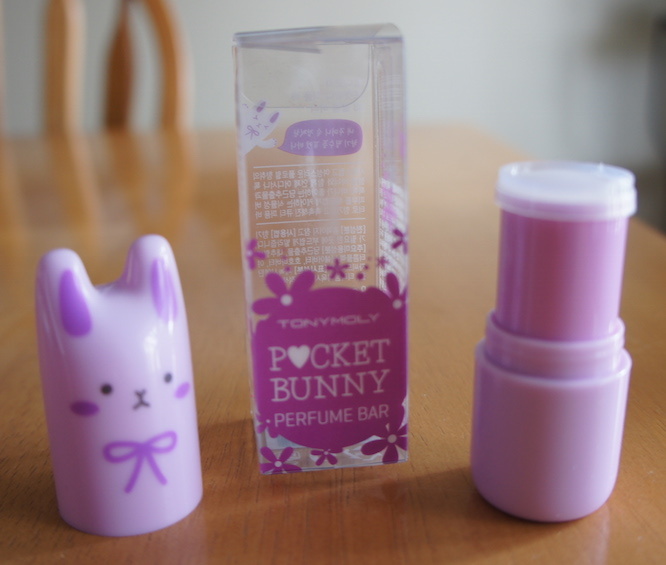 The Pocket Bunny line has one for dry and oily skin types. I went for the “sleek mist” since I have oily skin. I think I would’ve used this more if I still was in Korea. Just based on where I am now and how much time I’m indoors I don’t use this as much. If I was a bit more outdoors-y (or maybe if my work environment was more dry) I’d use it more. Also, I could do without it having a scent. It’s not a bad scent, but I’d rather just do without. But it does the job and works fine for me. I’m always jealous of my friends who can do a really nice job with their eyeliner. So I like to try out different kinds to see if I can get it down. So I went with this waterproof gel liner. It’s a cross between a gel and a liquid liner (hence the name). I like it because I feel like I can get a fairly decent line with it. The color is a very dark brown, almost a black. If you have a steady hand you can get a fairly decent line with it. I still need practice, but even I can make a nice wing using this liner. These are some lovely colors. Admittedly the Etude eyeshadows aren’t always long-lasting. I did, however, have more success when using the eye primer. I didn’t have to worry much about re-applying. A very nice set! It covers all the basic for eye make-up. I love the Play 101 pencils so the black is a nice basic one to have for your make-up needs. 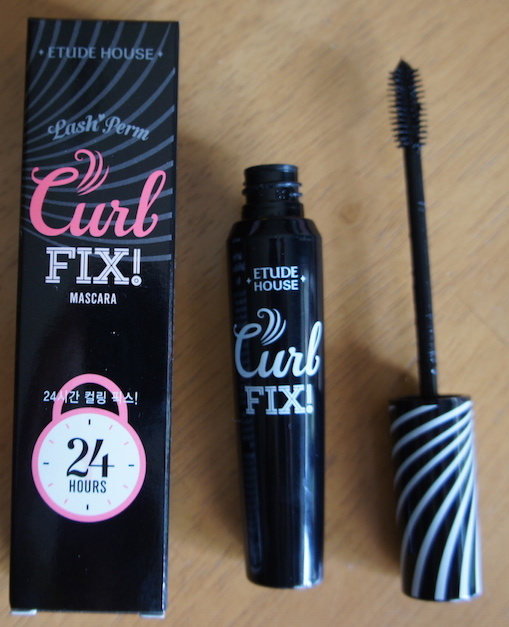 The Curl Fix mascara was way more effective then I imagined. That stuff does not wanna come off! I work it when I was working out. I wore it in the shower. Even then it did not wanna all come off. That is it’s strength but also it’s downfall. When I want make-up off, I want it off. This was so resistant. I used eye make-up remover and cleaner, and those didn’t take it off 100%. I guess they sell a mascara remover, but I haven’t bought it. I feel like I shouldn’t have to buy a specific product to take it off. So if you’re looking for a long-lasting mascara this one is awesome! But beware — it gets very attached to you. What a neat little product! This is perfect for no-fuss sort of people. It’s also great to carry around because it’s so light and easy to apply. I bought a neutral color. It applies well and has plenty of sparkle. 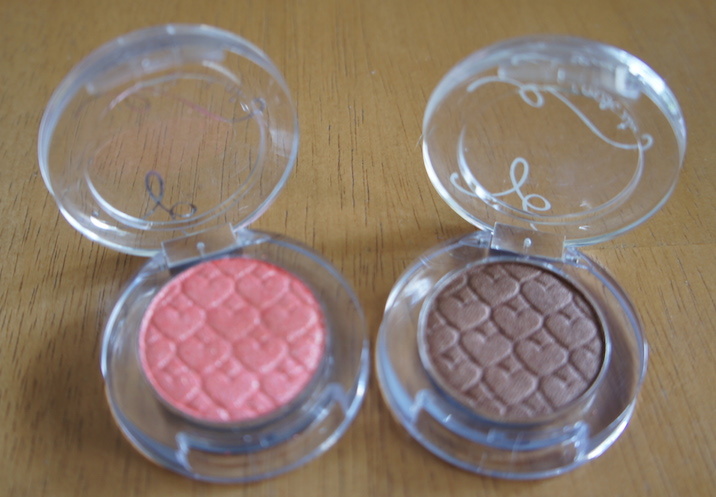 Like many Etude eye shadows the color fades after awhile, so you should reapply it. It’s not a huge issue for me, but maybe that’s because I’m not too fussy. I’d like to try other colors since they one I got was pretty basic. Ah the Play 101 pencils. So colorful. So creamy. I love ’em! It’s really different from the sort of liners I usually use. I do have to re-apply them every so often, but not anything that I’m not used to. They go on so smooth, and I can’t get over all the color options. I think they can be a really nice addition to anyone’s make-up routine. I hope you found my review useful! If you have question about the products I showed feel free to comment down below. Hello, lovelies! I’m back with another FAB post! 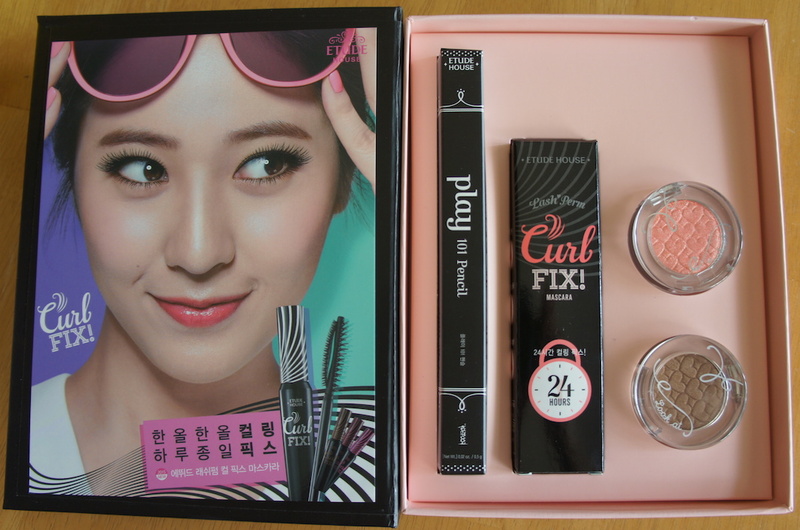 This time I’m reviewing more Korean make-up products. I bought all of these from Jolse.com. I’m so happy I found this site. It is an online shopping mall located in Korea. The site is in English and Spanish, and is easy to use. There are lots of brands to choose from, and I feel like prices are reasonable. Shipping costs aren’t too high, but it will take some time for you to get your shipment (around 2-4 weeks). I’m happy with my experience with the site, so I’ll be ordering from Jolse again the future! I talked about the Moistfull Collagen Cream in one of my previous make-up reviews. It’s a product I picked up when I first got to Korea, and I’ve loved it since. I use it as my moisturizer in the morning and evening. It feels soft/soothing when I put it on, and you don’t need a lot of it. One of my favs! 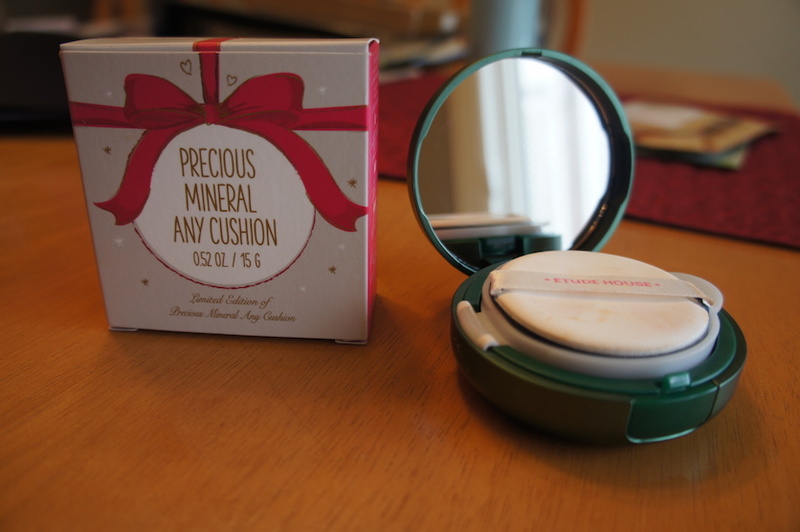 Despite the silly name, this is a nice BB cushion. I’ve used Etude’s Any BB cushion before, so I got sucked in again by cute packaging. I bought Natural Beige (W13). Pretty much your standard cushion which is in reference to the part where the BB cream comes out. The cushion part is nice because I don’t overdo it with the amount I use. It’s also SPF 50+, which is fairly common with Korean BB/CC creams. The color is a little light for my skin tone although it doesn’t make me look ghostly white, so it’s not bad. Another nice thing is that you can buy refills for it. The cushion/sponge holder part pops right out! Mask sheets are the best! It’s a cheap way to give your skin a bit of a mini spa treatment at home, and it’s very quick (you only need to keep them on for 10-15 minutes). Every store has different sheets with different properties. I decided on Etude House since Jolse.com had a really good deal on them. Every sheet has something that is does well – brightening, whitening, moisturizing, revitalizing, etc. 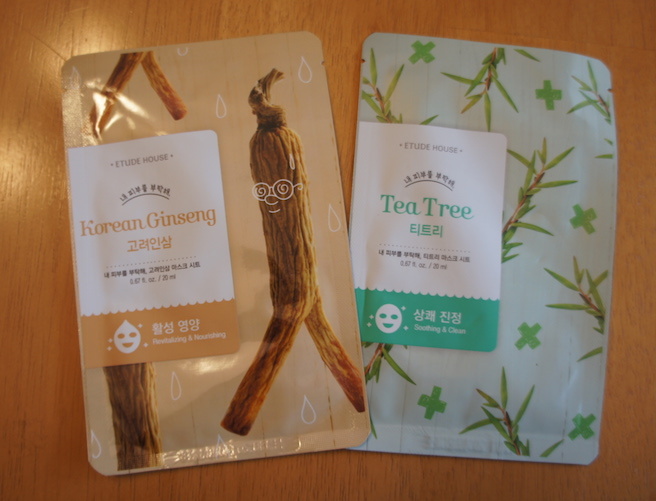 I went for Korean Ginseng and Tea Tree this time. They’re pretty typical mask sheets. They do have the scent of the ingredient they’re named for though luckily the tea tree is hardly noticeable (if you’ve smelled tea tree oil straight up you know it’s powerful stuff!). I like what they do for my skin and I haven’t had any adverse reactions, so I’d recommend these. Here we have a Korean brand being sold in the U.S. Hurray! 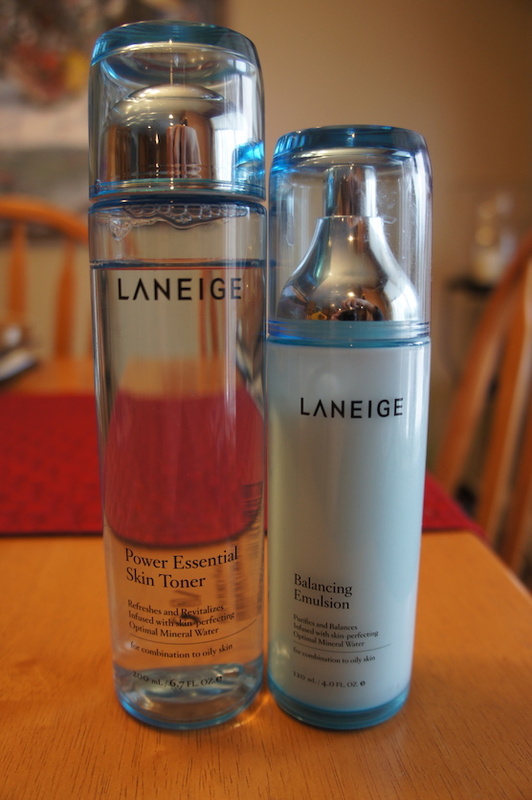 I found that Target started carrying Laneige in their stores and on-line. 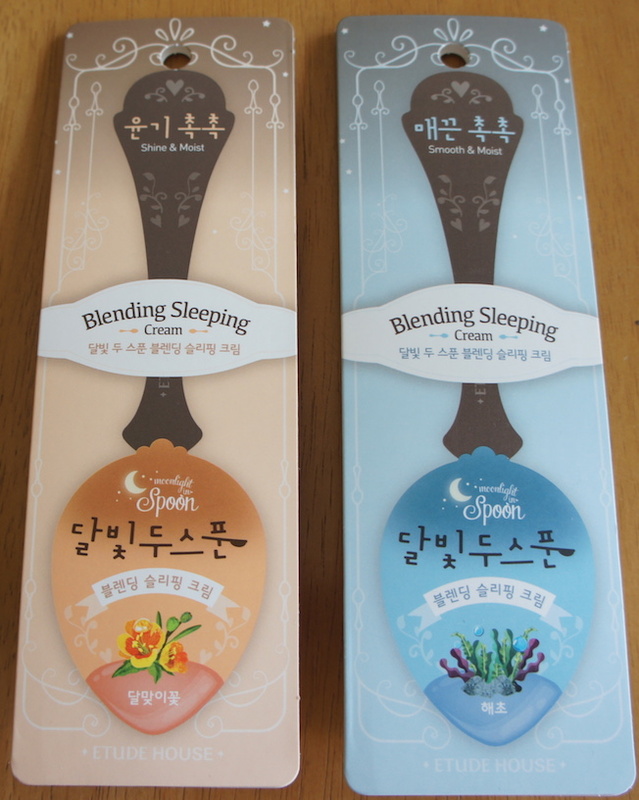 Korean skincare products are known for being high quality, so I decided to buy a couple products. I’d never used products like these very much except for when I got free tiny samples at stores. I had heard, though, they can make a big difference. I tend to break out a bit around the nose area, but since I started using these I’ve noticed that I’ve gotten a lot less of them. Nice! The toner is $25 and the emulsion is $28, and you can find them here. Tony Moly is another good brand that I don’t hit up as often as I should. I decided to try for an eyeshadow this time. 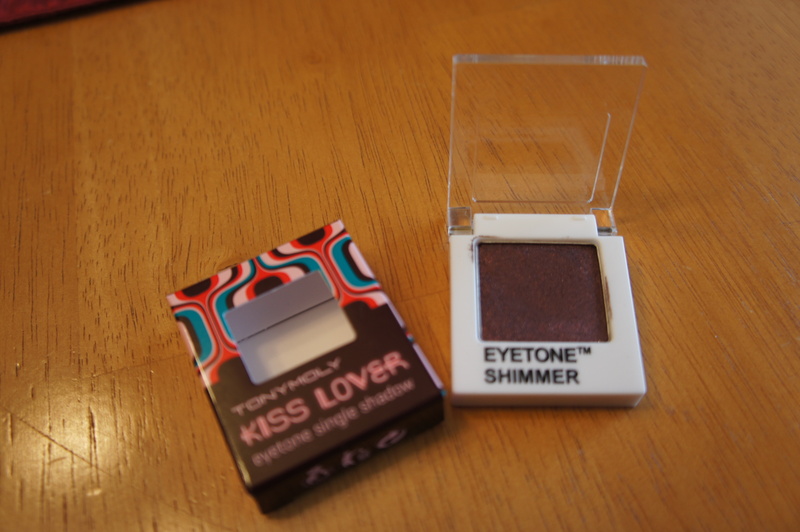 I got a shimmer color – S06 Girls’ Burgundy. It’s pretty dramatic which is different than my usual soft or neutral look. Would probably be cool to experiment with a smoky look with this one! As if I didn’t have enough lip products! When winter gets as cold as it does here, you always need a good lip balm. This beats the hassle of using more than one product or having to go without color in favor of a balm. I got No.1 Flame Rose – a rose-y red (as the name implies). Not too light or too dark. 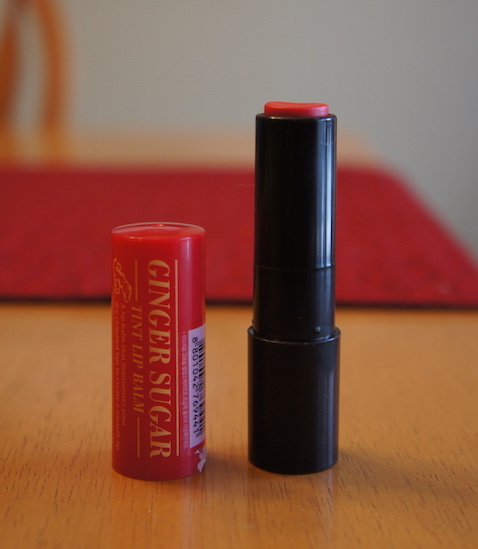 It goes on with the consistency of a lip balm, but doesn’t feel sticky or anything. I started experimenting with different eyeliner colors last year since I was always doing black or brown. I love using different colors now! It’s a fun way to change up your make-up look. 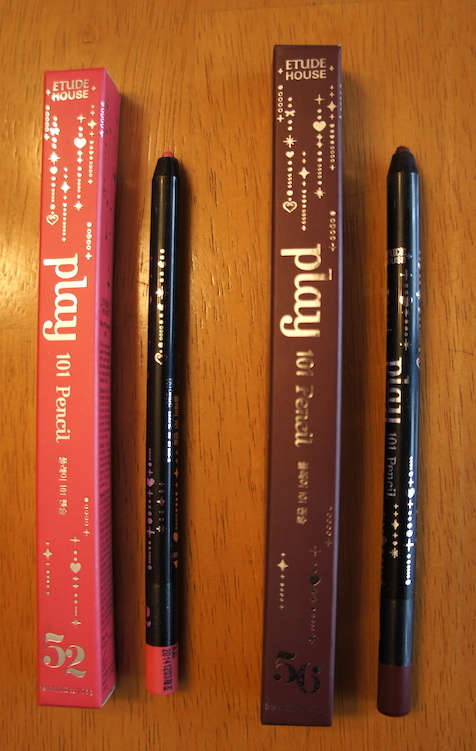 Etude House has their Play 101 Pencil line, though the ones I bought were the Holiday Limited colors. So even if these colors aren’t around anymore, they still have some other great ones you can check out. I got #52 (pink) & #56 (burgundy/purple). #52 is pretty light so I think you’d have to match it up with another color or product. #56 is dark and lovely. Both are creamy so they go on smooth. 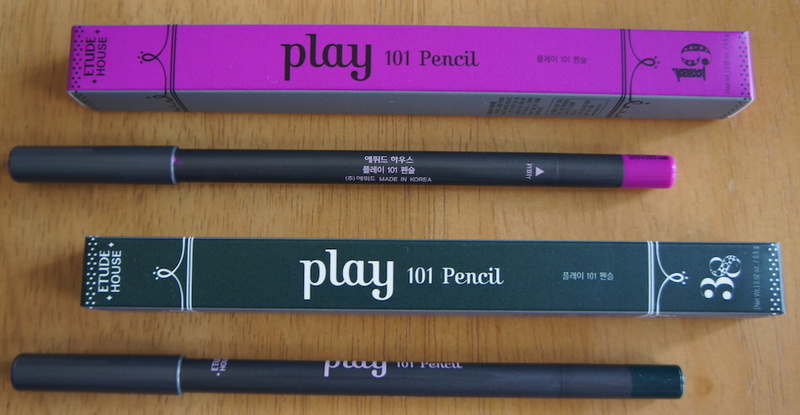 The Play 101 Pencils also have different styles so some have glitter, some are glossy, and some are plain creamy. Either way, I really love these colors! So, once again, I’m pleased with all the products I ordered. I know I need to change things up by not ordering so much Etude House all the time. Can’t help it! I’ll do my best to have more variety with my next order. Posted in make-up, shopping, vlog	by Oh Happy Dae! I recently ordered a few things from YesStyle for the first time. I took advantage of some coupons during Black Friday and I’m pretty happy with what I got! 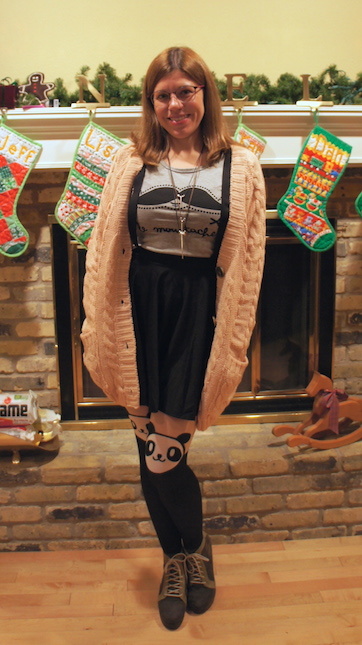 First are these cute panda tights. I love pandas! The tights fit well — I sometimes found Korean hosiery too small (although this is a Japanese brand, mind you). I also like that they give the illusion of knee highs, but I don’t have to pull them all the time like knee highs. I also got this oversized, warm knit sweater. Oversized sweaters/tops seem to be a “thing” with Korean girls (from what I saw). I grew to like the style. It’s not as pink as I thought — more of a very pale pink. I love it though! 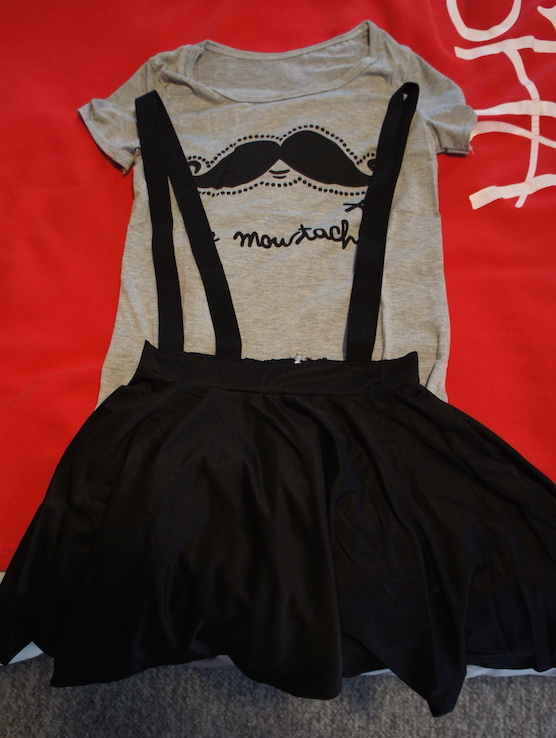 I also got this t-shirt and suspender skirt set. When I opened the package I was worried it wouldn’t fit because it looked very small. Although the shirt is snug on me, it’s not uncomfortable. The skirt is just the right length too. I found, in Korea, that I had to really check out skirts/dresses because most Korean girls don’t have as much going on in the back. That meant dresses could go from being cute to somewhat obscene on me lol. Although I do have some qualms with how it’s constructed. Honestly, the zipper wasn’t put in well (as in, it shows more than it should), but it’s not that terrible. The make-up is from Tony Moly. 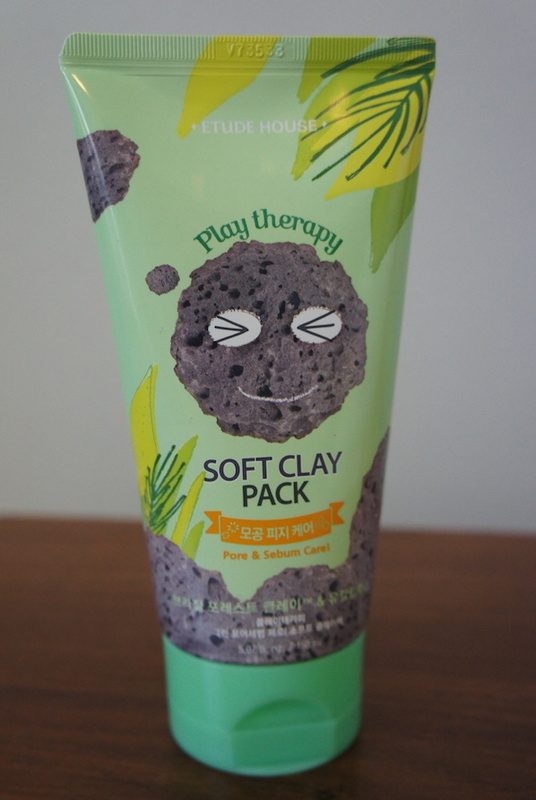 Totally cute packaging, and I really like the products. The are, unfortunately, not available on YesStyle anymore so I’m not sure if that means they are out of stock, or if Tony Moly no longer sells them. I found both products at Jolse.com! 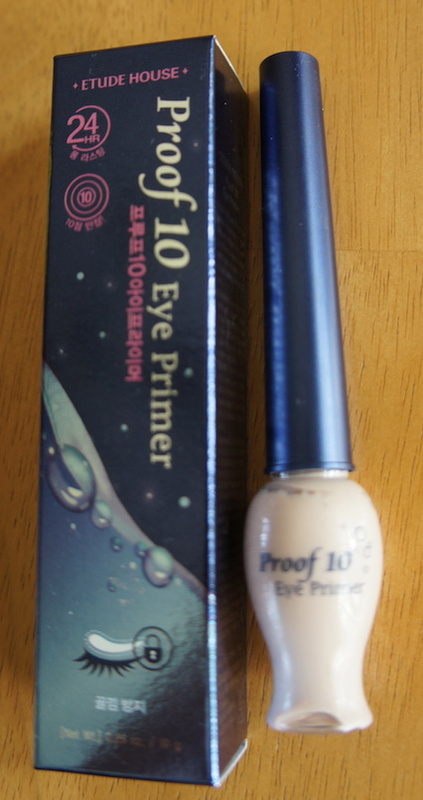 Overall I’m pretty happy with YesStyle, and I’d order from there again. Have you guys ever ordered from there?